Before I knew I had a wheat allergy, my friend Natalee, who eats gluten free, made homemade gluten-free buffalo chicken wings for a football game our families were watching together. Natalee had also purchased regular wings at the store to serve alongside the gluten-free wings. 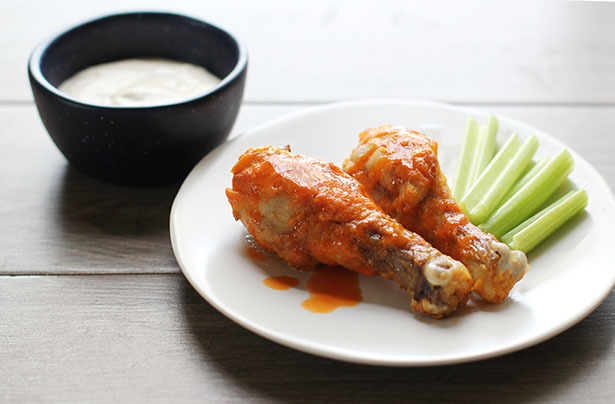 Interestingly there was no comparison between the “real” wings and Natalee’s gluten-free buffalo chicken wings – Natalee’s wings were a million percent better. Once I found out about my wheat allergy, I was at Natalee’s feet begging for her recipe. She simply said, “Go to this link and use gluten-free flour.” Well, that was easy! Or so I thought. It took me a few tries to get this chicken really tasty. Really it was all about perfecting the technique for baking them in the oven, but we finally go there. 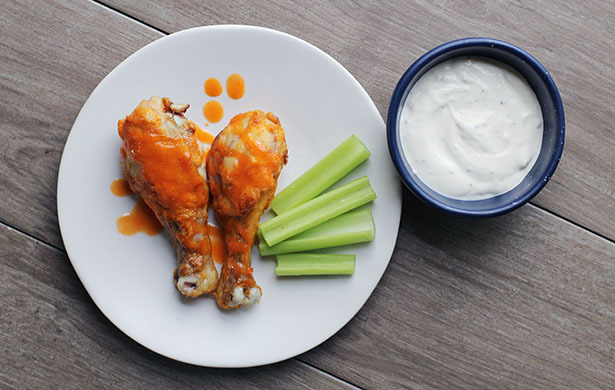 Every last person in our family loves these gluten-free buffalo chicken wings and Nate and could probably drink the sauce it’s so good. Also, we’ve started using drumsticks instead of wings. We just like them better and this recipe makes for a really great dinner option. 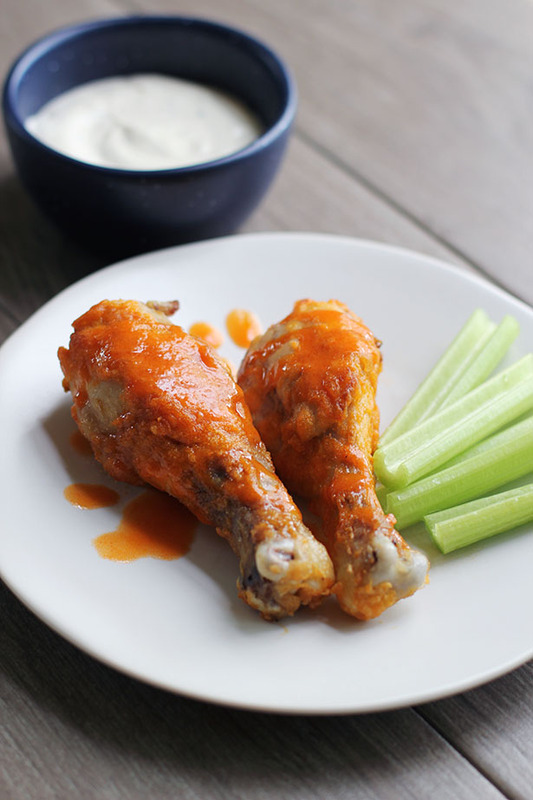 We no longer reserve buffalo chicken just for watching football! Place a metal cooling or roasting rack on top of a rimmed cookie sheet. I use my metal baking cooling racks and my half-sheet rimmed baking pan. I also like to cover the pan with aluminum foil to make for easier cleanup, and then place the rack on the pan on top of the foil. Cooking the chicken raised up off the pan surface is KEY to success here. The chicken comes out significantly better when it's raised up out of the pan while cooking. Whisk together the flour, cayenne pepper, garlic powder and salt in a large bowl. Toss each chicken piece in the flour mixture then place them on the prepared pan. Refrigerate chicken for at least 1 hour. Whisk together the melted butter with the hot sauce. Dip each piece of chicken into the sauce and place back on the prepared pan. Sometimes the cold chicken will make the sauce thicken. If this happens, simply zap the sauce in the microwave for 10 seconds or so to get it runnier again. Bake for about 45 minutes, until the chicken is no longer pink inside and/or reaches a temperature of 160º-165º F at the deepest part of the meat. Be sure to flip the chicken half way through the cooking time, about 20-25 minutes in. Serve hot! Also, we love the sauce so much, so I often make more sauce to serve with the chicken. Just mix equal parts butter with Frank's RedHot sauce, usually 2 tablespoons each is a good amount. Hello! In case you missed it, the podcast is starting up again. Click here for the latest episode! And now down to the business of planning this week’s menu. – Movie night at the school, which includes pizza for the kids! Please share your own meal plans in the comments below! Your menus from last week were so incredibly helpful this morning. I know I’m not the only one who loves seeing what you’re cooking, it’s such great inspiration! Thank you and have a great week! 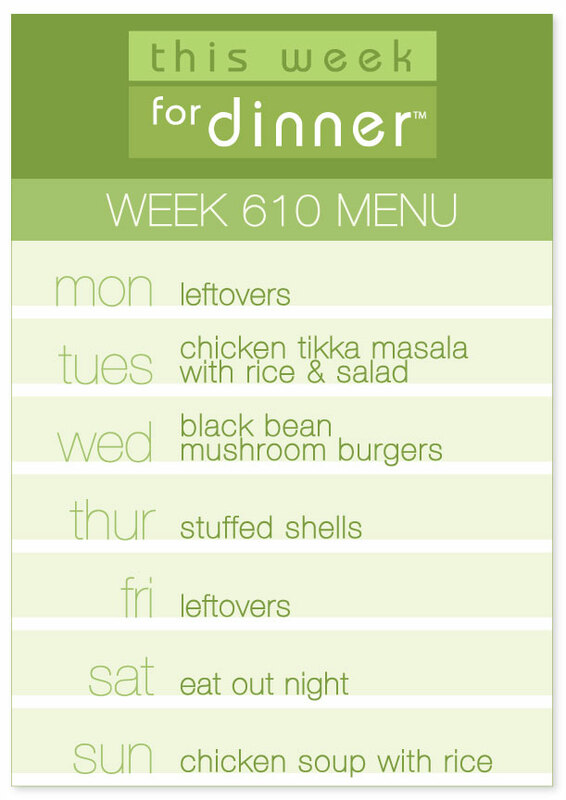 The biggest reason this weekly menu is awesome is because of all your comments each week. Please share your menus below! Can’t wait to see what you’ve got on the docket in the kitchen this week! It’s Friday Show and Tell time! 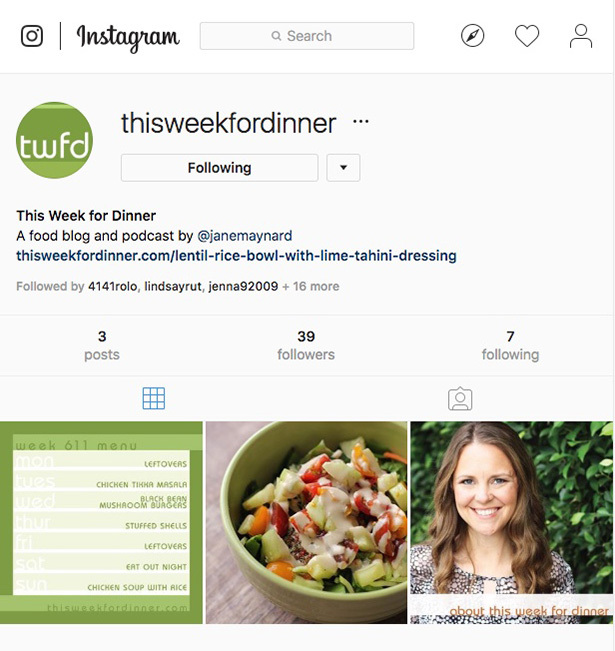 This Week for Dinner is on Instagram! So, my blog turned 12 last week. I totally forgot about the blog’s birthday, so, you know, Happy Birthday, Blog! Good job on 12 years and all that. Anyway, I’ve been on Instagram forever but have never focused exclusively on food content because, well, Instagram was sort of my happy place where I did whatever I wanted. It still is, but I have finally pulled the trigger and got This Week for Dinner going on Instagram. I would love love love it if you want to follow me over there. I’ll share content from the blog as well as the podcast (which will be starting up again soon! 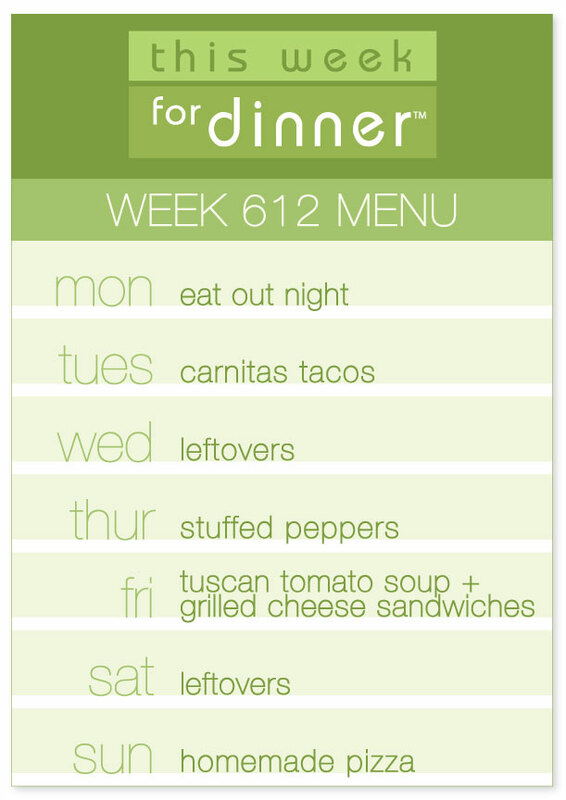 ), the weekly menu and great food! The handle is simply @thisweekfordinner. 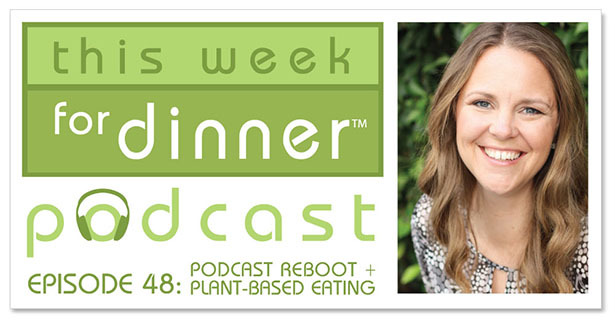 Two of my favorite podcasts had some great episodes lately talking about plant-based food. They’re really well done and super interesting, so I definitely want to share them with you! I love Science Vs, it’s a delightful science podcast by Gimlet media and the host Wendy Zukerman is one of my favorites. Anyway, they recently did an episode about vegan diets, looking at different vegan and anti-vegan claims (like vegans are better for the environment and you need cow’s milk to be healthy) to figure out what was true. You can listen to the episode here: Vegans: Are They Right? But what I really want to share is the follow up episode about milk alternatives, or shmilks as Wendy calls them. It’s a super short episode that looks at the environmental impact of soy, almond, oat and cow’s milks. At the end of the episode, my 11-year-old Anna said, “Well, it looks like probably our whole family should start using your oat milk, huh, Mom?” You can listen to the episode here: Soy, Almond, Oat Milks: Are They Udder Bull? That’s all for today! And, as always, show and tell is for the whole class! Feel free to share whatever you want in the comments below! As part of my new year’s resolution to focus more on plant-based eating, I promised you I would share all kinds of tips and ideas throughout the year. Today is the first of these posts, which I will call “Plant-Based Eating Hacks.” A bigger focus on plant-based eating doesn’t mean you have to go vegan, but those of us who aren’t vegan or vegetarian are often unfamiliar with the great options out there for plant-based eating. Let’s explore those options together! Today we’re going to start with a classic dessert we all know and love: ice cream. Yep, we’re talking about non-dairy, plant-based ice cream with nary a drop of cream in sight! Three years ago I had the chance to travel to Vermont to visit the Ben & Jerry’s headquarters. It was ridiculously cold, I had a 5-hour flight delay in Chicago and I discovered on this trip that I have sacroiliac dysfunction (which basically just means excruciating pain). Despite all the cards stacked against me and the fact that I hobbled about like a 150-year-old woman addicted to ibuprofen, it was hands down one of the most fun trips I’ve ever been on. We toured the factory (including the production floor! 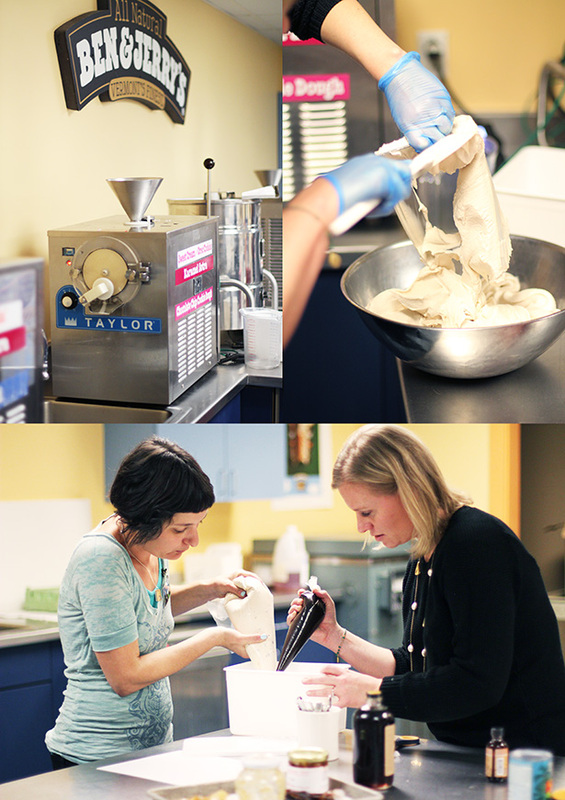 ), ate ice cream straight from the production line, and even got to create our own new ice cream flavors in the test kitchens. The experience was unforgettable. 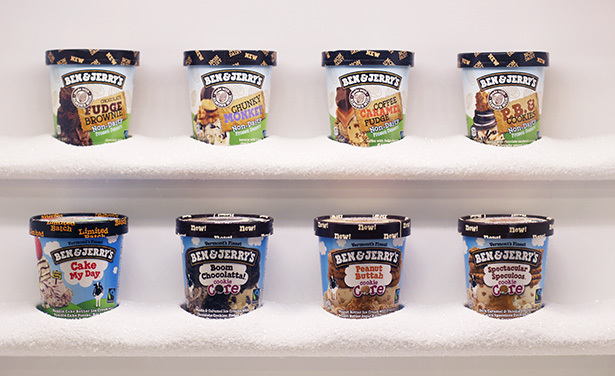 Ben & Jerry’s hosted this media trip as part of their non-dairy frozen dessert product launch. I was the only writer on the trip who was not vegan. At the time I was a full-fledged dairy consumer and knew very little about veganism, quite frankly. But I walked away from the trip with two things. First, really wonderful vegan friends who were open and ready to teach me in the least-judgy way imaginable. Second, a love for non-dairy, plant-based ice cream. Why Non-Dairy, Plant-Based Ice Cream? Here’s the thing: you totally do not need cream to make good ice cream. I know, it sounds like crazy talk. But since I cut dairy a year ago, I can attest to the fact that my non-dairy, plant-based ice cream options have left me completely happy and not missing “real” ice cream at all. And, as we learned in my plant-based eating kick-off post, cows are a huge drain on the environment. 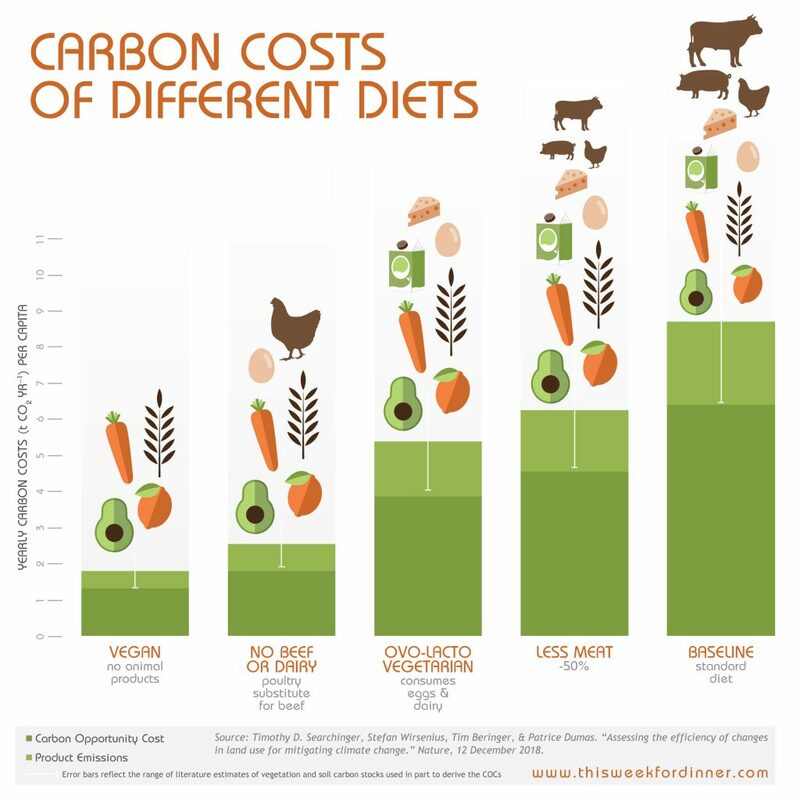 Eating red meat and dairy makes for a reeeeeealllllllyyyyyy big carbon footprint. If you can sub out that dairy with something equally delicious, why wouldn’t you? 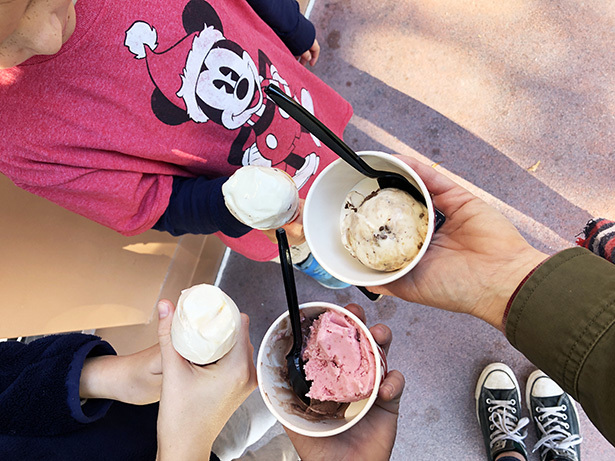 I’m going to share two great non-dairy, plant-based ice cream options that I love with you today. And then I’m going to ask you all to share your own favorites in the comments! Let’s make this the best collection of plant-based ice cream recommendations around! As I mentioned, about three years ago Ben & Jerry’s launched their non-dairy frozen desserts line. At the time I believe there were 4 flavors, but today the line has expanded to 11 flavors (and I’m sure it will keep growing). All of Ben & Jerry’s non-dairy frozen desserts are made with an almond milk base (which is delicious, btw) and are certified vegan. And since I have yet to write about that trip from many moons ago, I have to share some pictures with you. Pictured: The Ben & Jerry’s test kitchen where they develop new flavor – we had the chance to create our own non-dairy frozen dessert flavors. My partner Becky from Glue & Glitter (bottom left) and I decided our ice cream should be called “Beck & Janey’s.” Aren’t we clever? Salt & Straw is a Portland, Oregon-based ice cream shop that that serves unique and quirky ice creams that taste amazing. They have started to expand to other states and the kids and I recently visited their Anaheim location. 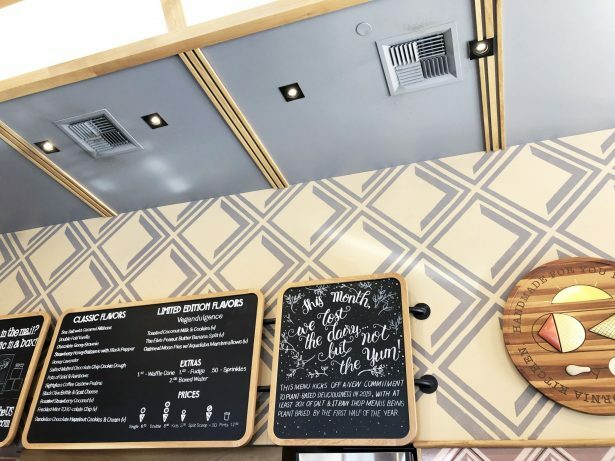 Salt & Straw has made a commitment to make 20% of their product line plant-based by the first of of this year. From what I recall on my last visit, their non-dairy ice creams are all made with a coconut milk base. My 7-year-old meat eater son Owen is very resistant to my plant-based food changes, so when he happened to pick one of the vegan flavors at Salt & Straw, I just kept my mouth shut. I only let him know his ice cream was vegan after he was done eating. He looked shocked and then just laughed. If you can fool Owen, you can fool anyone. I know not everyone has access to Salt & Straw, but when you visit your favorite ice cream shops, keep an eye out for non-dairy options! Last summer the kids and I visited Honeycomb Creamery in Cambridge, MA. They had a few vegan options, including an ice cream made with a cashew milk base, which was divine. I’m telling you, now is the time be alive if you’re wanting to eat more plant-based foods. The trend will only continue and these ice cream companies are proving that plant-based ice cream can be done in a truly delicious way. 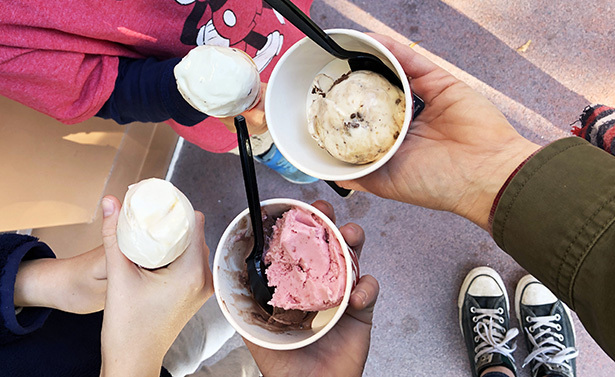 Tell Us Your Favorite Non-Dairy, Plant-Based Ice Cream Brands! Now that I’ve shared a couple favorites, it’s time for you to fess up! Tell us your most favorite non-dairy, plant-based ice cream brands and flavors in the comments below! Vegan Bloggers I Met at Ben & Jerry’s. These blogs are fantastic resources for plant-based eating! Last month I visited my Aunt Sue. Sue had to change to a gluten-free diet many years ago due to some health issues. She is an excellent cook with an even more excellent attitude and has navigated cooking without gluten in the most delicious way. Also, she is my own personal treasure trove of tips, product recommendations and recipes now that I can’t eat wheat. While visiting her I stole several of her recipes (okay, she gave me the recipes, no stealing happened, stealing just sounds more exciting). One recipe was for her gluten-free chicken gumbo, which she served while we were visiting. I ate a lot of that gumbo. For dinner. Then breakfast. Then dinner again. Then I came home and have made it twice in the last month. Sue lived in New Orleans and knows her Louisiana cuisine. 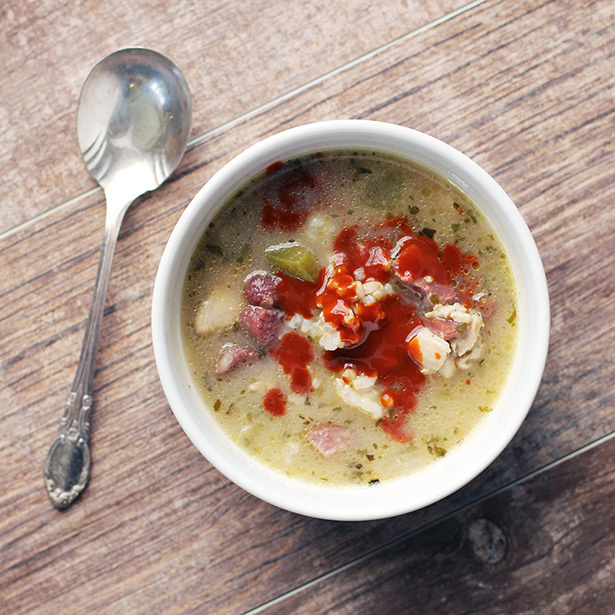 She originally found this gumbo recipe on the back of a package of Chef Paul Prudhomme smoked meat. The recipe she shared with me is straight from the package and she’s been cooking it for years. Since going gluten-free she started using her favorite gluten-free flour (Namaste Perfect Flour Blend) and it works like a charm. It works so well you would never be able to tell the difference. You can, of course, use regular all-purpose wheat flour if you do not need to cut wheat or gluten. I have added my own notes as well as Sue’s input in the directions below. 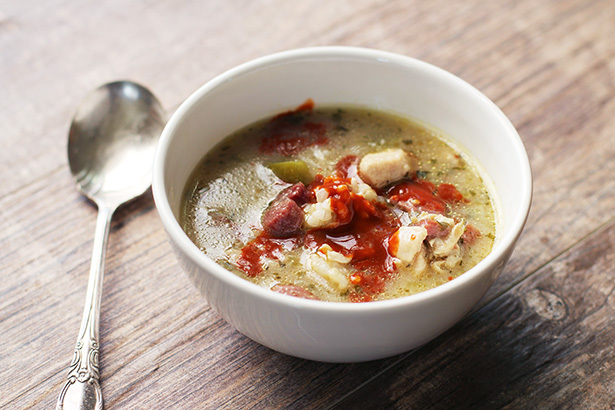 This gluten-free chicken gumbo has andouille sausage and tasso, but there are several suggestions for meat substitutions if you can’t find either of those. Recipe originally from a Chef Paul Prudhomme package. Modified for gluten free and with our own notes included. 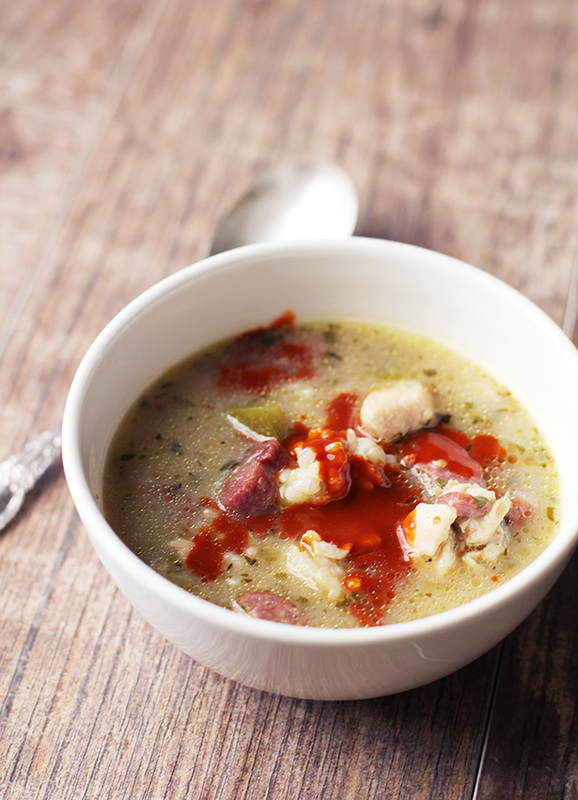 Cut chicken, tasso and andouille into bite-sized pieces and set aside in separate bowls. Heat chicken stock in separate sauce pan until nearly boiling. Once the roux reaches desired color, remove from skillet and transfer to large stock pot at a slightly lower heat. (If you just cook the roux in the soup pot to begin with like I did, simply reduce the heat to low.) Immediately add the tasso and andouille to the roux, cooking for several minutes until seasoning from meat transfers to sauce. Add cut chicken, cooking for an additional 2-4 minutes. Add chopped vegetables, sauté and let cook for a few minutes. Add chicken stock and seasonings, stirring constantly and scraping the pan bottom well. Slowly add hot chicken stock, one to two cups at a time until incorporated, reduce heat to medium/medium-low and simmer uncovered for about 45 minutes, stirring often toward the end of the cooking time. Serve hot over cooked rice and topped with Crystal Hot Sauce. So, last week. I totally did not follow my menu at all. I did in fact cook but ended up making totally different stuff for some reason. 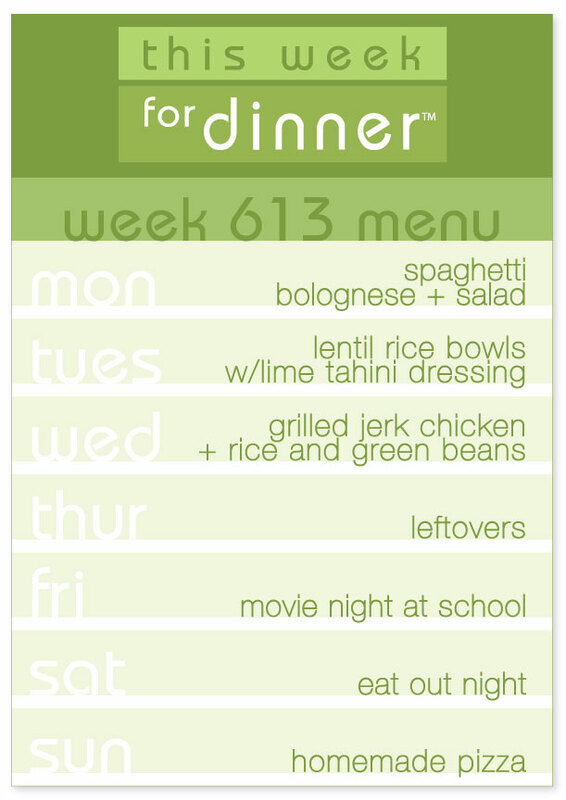 So, I’m just cutting and pasting last week’s menu. Probably the easiest planning session I’ve ever had! Your turn! Please share your meal plans in the comments below. Have a great week! Oh man, we had symphony tickets with the kids yesterday and the Super Bowl (yay, Patriots!) and I totally spaced on my menu. A day late but still getting it done! Your turn! Please share your menus below in the comments! They are SO INCREDIBLY HELPFUL for me and so many others. Thank you!